In the middle of the Karakum Desert in Turkmenistan lies an oasis where the city of Mary is located. And in Mary, just like in a nesting doll, another oasis is tucked away – an American cultural center where local students learn about international programs, take part in exciting educational projects and are given opportunities to apply to U.S. colleges. The American Corner in Mary hosts about 40 activities per month. These include academic writing sessions, educational workshops, movie nights and guest speaker events. The FLEX alumni are regularly conducting their own projects introducing local students to American culture through their experiences. ‘We are never bored here. 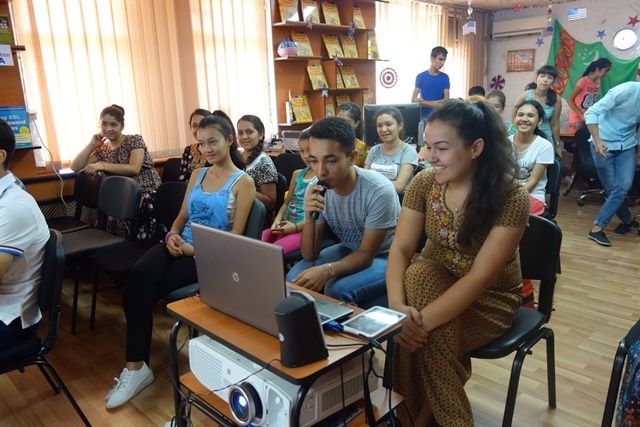 Each activity gathers dozens of enthusiastic young people and often they are inspired to come up with their own initiatives as a result,’ says the EducationUSA Adviser and FLEX alumna Diana Gurbanmyradova ’08. Diana herself is primarily working with high school students who are planning to apply to U.S. colleges upon their graduation through the EducationUSA Cohort Group Advising program. 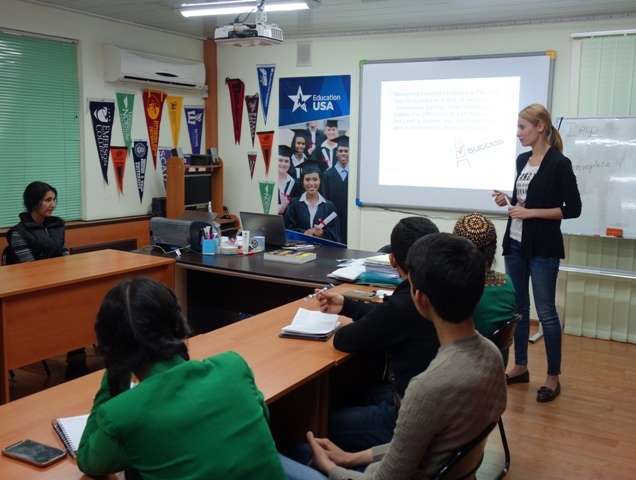 Since many Turkmenistan’s high school graduates lack sufficient English skills and do not have much experience in filling in extensive application forms in a foreign language, the FLEX alumna helps them to develop their knowledge and build experience through individual consultations and regular study sessions. ‘We are sharing strategies on passing SAT and TOEFL, advice on how to find a suitable school and choose a major, and also help look for financial aid. All the services are free of charge and assistance is based on students’ interests and capacities,’ explains Diana. 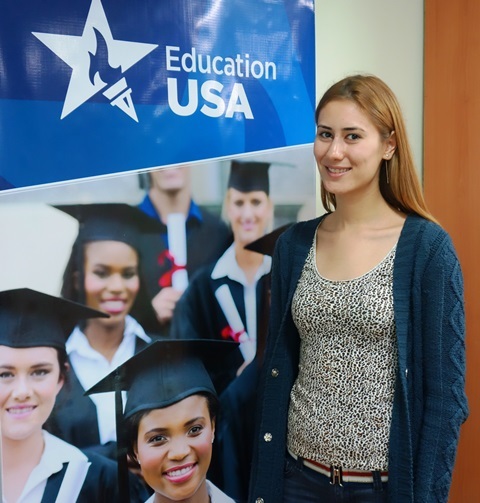 One of the students taking part in the EducationUSA program is a FLEX alumna Gyzylgul Hojalyyeva ’16. Having always been interested in healthcare, she is now preparing to apply to U.S. medical schools. She attributes her interest in receiving a U.S. medical education to her host mother’s influence. ‘My American host mom is a nurse and during my FLEX exchange year she told me a lot about her work. She also took me to her office once and I was very impressed by what I saw. To build up on my knowledge I took a nursing college class in my high school and now I’m determined to become an oncologist – a doctor specializing in cancer treatment,’ shares the FLEX alumna. For Gyzylgul helping and supporting people is everything. She started volunteering in the American Corner before her FLEX year and has continued organizing educational events for students since her return to Mary. In summer together with a few other FLEX alumni she led two initiatives entitled ‘Travelling across the U.S.’ and ‘A Day in an American High School’. Both of them allowed the participants to be immersed in various aspects of American culture through interactive workshops. ‘In the travelling project we took young people on a virtual tour of various American regions. Every region in the U.S. is unique and we talked about weather conditions, food, traditions, and shared some personal stories,’ says Gyzylgul. In ‘A Day in an American High School’ the participants found themselves to be American students. They chose their subjects, attended classes, had an American high school-style lunch, and even took part in extracurricular activities. In October the FLEX alumna decided to bring two cultures even closer by asking her host parents to participate in a Skype session with a group of local students. This Skype session was part of an ongoing project where FLEX alumni from Mary invite their host families to talk to the town’s young people. Gyzylgul’s host family eagerly agreed and the session was set up for 10 am Turkmenistan time (11 pm Iowa time). The event stirred a lot of interest in both corners of the world. Many young people in Mary were excited to talk to a real American family, while in Iowa, Gyzylgul’s host parents, shared the news with their family and friends. ‘My little American sister didn’t want to miss it and asked her parents to wake her up. And my host grandparents wanted to attend it as well but it was a bit too late for them to drive,’ says Gyzylgul. ‘It couldn’t have gone any better – each side asked the other lots of questions and told many great stories. We couldn’t stop discussing our cultures and laughed so much,’ she adds. Since the FLEX alumna had made many traditional Turkmen dishes for her host family, the Americans felt at ease discussing their favorite Central Asian foods. Mary’s students, on the other hand, knew a lot about famous American fast food chains and sports. ‘The American family and Turkmen students had obviously never met each other in real life. But they quickly felt comfortable talking to each other based on their universal similarities,’ highlights Diana. To both FLEX alumnae that’s where the essence of international exchange lies – learning more about each other and using this knowledge to make a difference in their communities and on a global scale. ‘We, the FLEX alumni, are all intercultural ambassadors now and we should use the knowledge of our countries in order to contribute to our communities. International exchange is all about sharing skills and traditions and we should continue to do it upon our return home,’ encourages Diana her fellow FLEX alumni.